Andrew Johns is a Rugby League legend, whose freakish ability and undying competitiveness have seem him heralded as the greatest player to ever play the game. He became rugby league’s eighth ‘immortal’ when the announcement was made during Grand Final Week at the end of September, 2012. This is thus a great time to acquire a great collectible! Joey’s sudden retirement meant that footy fans the world over were denied the opportunity to watch the Cessnock sorcerer in action again, but it gave us the chance to reflect on the enormity of what he has achieved. ‘For The Love of The Game’ is a stunning lithograph which is the perfect way to remember Andrew John’s career. Featuring a collection of images and match information spanning Joey’s distinguished career, and signed by the man himself. Limited in edition to just 300. Personally signed by Andrew Johns. 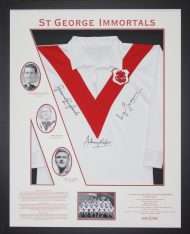 Accompanied by Certificate of Authenticity and licensed through the NRL. Approximate framed dimensions –900mm x 600mm.